1) Concentrate on those positive things in your life. You have to cultivate the habit of being thankful for all the good things you have or have received, your skills, capabilities, talents, blessing and other things in your life that are worth being thankful for. 2) Always make a decision to be happy. No matter what make a decision to always be happy with yourself no matter what situation you find yourself in life. Choose happiness, it pays, nothing is worth worrying over, being happy affect your outward appearance. 3) View challenges from another perspective. Life is a book and the chapters are all that we go through (challenges) in life on a daily basis. It is interesting that each challenge that comes our way bring with it an opportunity to learn. To this end each challenge comes with a positive outcome which we have to always focus on. 4) See life is a journey. Having or building a positive attitude has to do with us, seeing life has a journey filled with a lot of lessons to be learnt on a daily basis. These lessons are there to make us better people over a period of time. 5) Try to always see the positive side of life. This is what you have to learn, to always see the positives in everything you do or experience daily. 6) Start the day being positive. 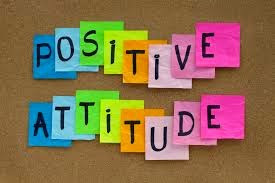 Begin the day being positive no matter what comes your way, make that decision to be positive throughout the day, in other words, be filled with positive thoughts. 7) Be around happy people. To have a positive mindset, you have no choice but to stay around positive people and also , avoid being around those that have a negative way of seeing things in life. What it does it that , gradually you will start thinking positively with time thereby developing that much needed positive mind set. 8) Learn to stop anything that will expose you to any negative news. Avoid reading or listening to anything that will make you have a negative mindset or attitude. E.g . bad news, bad movies or anything to change your mindset to a negative one. 9) Go to bed being grateful and happy. End everyday being thankful for all the positive things experienced in your life throughout the day and be happy for all of them. Always believe in yourself and the abilities you have in you. Always remember that it takes you to succeed. 11) Do those things that make you happy. 12) Take time everyday to smile. Learn to smile from time to time and also try putting on a smile throughout the day. a) Experience success in you in all your endeavors. c) Increases your ability to achieve your goals faster than you can imagine. d) Enhances your ability to make better choices in life. e) Makes you live a limitless life because you won’t be restricted by your fears. h) Enhanced ability to make better choices in life. Do you have a positive mindset? Add your comments please.